"West" was best in the 98th annual Battle for the Bridge. "West," in this case, was the West Linn football team and the Lions stepped up big-time in the longest running high school football rivalry west of the Mississippi, blasting out to a 39-point lead in the first half and riding that to a 46-14 rout of Oregon City at Pioneer Memorial Stadium on Friday. "I challenged my guys to play like they're capable of and start fast, and take care the football on offense," said West Linn coach Chris Miller. "We did that, as evidenced by the 39-7 halftime score." The Lions extended their winning streak in the series to five games, though the Pioneers still hold a 50-47-1 series lead. With the win, the sixth-ranked Lions improved to 3-2 in Three Rivers League play (6-3 overall) and finished tied with Lakeridge for third place in the TRL. Next up, the Lions will host No. 27 McMinnville in the first round of the Class 6A state playoffs at 7 p.m. Friday. The Grizzlies enter the contest at 5-4 after finishing fourth in the Pacific Conference. No. 16 Oregon City, meanwhile, saw its two-game league winning streak snapped and finished TRL play in sixth place at 1-4 (4-5 overall). In their playoff opener, the Pioneers will host No. 17 Grants Pass at 7 p.m. Friday. The Caveman come into Friday's contest at 6-3 after tying for second place in the Southwest Conference. Among the offensive highlights for West Linn were: senior running back Dawson Jolley ran for 231 yards and four touchdowns, scoring on runs of 4, 41, 48, and 71 yards; senior quarterback Ethan Long came back from a sub-par performance against Tigard to go 22 of 31 passing for 333 yards, two touchdowns and one interception (he also ran for a touchdown); and five receivers picked up at least 50 yards each, with Damiko Tidmore Jr. and Cade Knutson both catching TD passes. 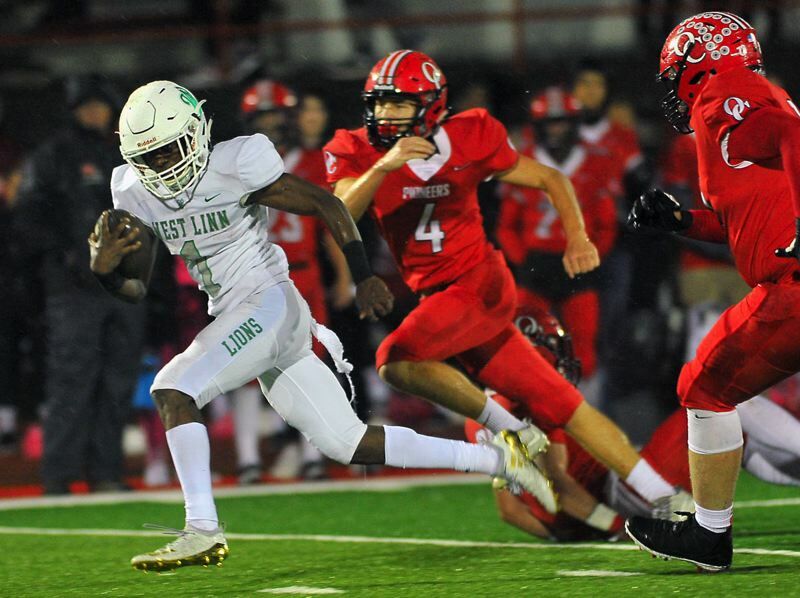 West Linn put Friday's game out of reach early as Long threw an 8-yard touchdown pass to Tidmore, Jolley scored on runs of 48 and 41 yards, and Long scored on an 8-yard run to give the Lions a 25-0 lead before the end of the first quarter. Jolley scored again on a 71-yard run with 5 minutes, 17 seconds to play in the second quarter, and Knutson then caught a 31-yard touchdown pass from Long with 3:11 left in the half, pushing the Lions' lead to 39-0. "Dawson Jolley was the best player on the field Friday night," Miller said. Oregon City finally found the end zone for the first time when Oregon City quarterback Colby Iverson threw an 11-yard touchdown pass to Calvin Green with 1:02 to play in the second quarter. Iverson, who also scored on a 14-yard run in the fourth quarter, transferred to Oregon City from West Linn for his senior season. For the game, he completed 8 of 22 passes for 69 yards and rushed 28 times for 128 yards. Oregon City's Zakayas Dennis-Lee finished with seven carries for 53 yards, but was held out of the end zone for only the second time in nine games. OC's Atlee Dodge added nine carries for 68 yards, and Zachary Woods eight carries for 36 yards as the Pioneers finished with 360 yards rushing and 429 yards total offense. For the game, West Linn amassed 642 yards in total offense, with Jolley also catching four passes for a team-leading total of 75 yards.